Jack London did it. So did Jack Kerouac, and James Michener. Riding the rails, with its heady mix of danger, crime, and the open road, has always been a powerful theme for these and other American writers. But today's train hoppers are adding something new to the literature of wanderlust. On the Internet, Web pages, chat groups, and even a home page for hobos are turning cyberspace into a virtual campfire where train hoppers weave new tales of adventure. 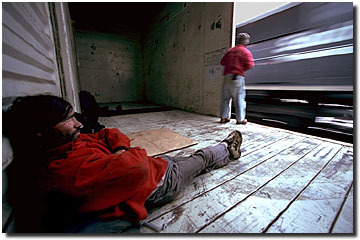 On the Train Hoppers Space website, a self-described cyber-tramp named North Bank Fred describes a recent ride from California to Utah. Hearing "the whistle of an approaching southbound," he jumps on and falls asleep to the "clickety-clack" of the rails. Arriving in Salt Lake City, Fred undertakes a fruitless search for his favorite beverage, White Port, a fortified wine that can't be sold there. Forlorn, Fred buys a pint of Jack Daniels and hops back, "vowing never to convert to Mormonism, nor take up residence in the state of Utah." Such tales are hopper classics, but there are good reasons to swap them in cyberspace. Hopping trains is dangerous work; tales abound of people who break legs trying to hop onto fast-moving freights, or are crushed to death under boxcars. "Bulls" - hopper slang for "cops" - are always on the lookout. And getting on the wrong train can mean endless hours of bone-chilling cold instead of a scenic trip through the Sierra. Writer Ken Howe says the Net has become a safe, anonymous way for hoppers to communicate. "There aren't many [written] forums for this quasi-illegal activity," he notes. Ironically, the Net has proved to be such a good channel that hoppers now worry that law-enforcement authorities will start using it, too. Recently, a hopper listserv vanished from cyberspace after it piqued the interest of a tabloid TV show. Better not to talk at all, hoppers reason, than tip others to their secret hobby. "It spooked everybody," says Howe. "This is a really underground, quiet thing."